Hu Jun (rear), and Shawn Yue and Nicholas Tse (front) in As the Light Goes Out. Derek Kwok's firefighter film is messy with sloppy story development, but the bromance and bombast work exceptionally. A rousing and entertaining action drama despite its flaws — of which there are quite a few. Nicholas Tse is solid as the conflicted lead, while Shawn Yue and Hu Jun bring the heroic cool. Also starring smoke and metaphors. by Kozo: Bromance and bombast abound in As the Light Goes Out, the big-budget firefighter flick from director Derek Kwok. 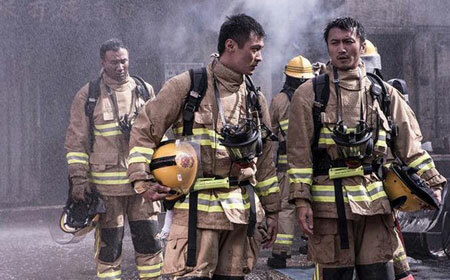 This EEG-funded behemoth stars Nicholas Tse as firefighter Ho Wing-Sam, who, along with fellow firemen Yip Chi-Fai (Andy On) and Chill (Shawn Yue), breaks firefighter protocol during a deadly building blaze in order to save more lives. Their actions come with consequences, and while Chill takes responsibility, Sam avoids it and Fai throws his buddies under the bus. A year later, their friendships are strained, and Fai has risen to the rank of Station Chief at the Lung Kwu Tan Fire Station, with Sam and Chill now serving beneath him. On the hottest Christmas Eve on record, the station has plenty of comings and goings. Sam is being transferred out, while senior officer Lee Pui-Tao a.k.a. the “King of Ladder” (Simon Yam) is due for retirement. At the same time, rookie firefighter Kin (William Chan) and mainland transfer Ocean (Hu Jun) arrive at Lung Kwu Tan Station. Politics abound at the station. While Sam covers for Chill, who’s misusing department vehicles to drive his son to a field trip at a power plant, Fai is lording over Sam, and reminding him that he’s always been his friend. That statement is debatable, as there’s plenty of passive-aggressive ball-busting going on between these men. There’s also standard firehouse hazing and rivalries happening, including minor friction between the grizzled Tao and the newly-arrived Ocean. More soap opera plotting: Chill’s son is embarrassed by his dad, who’s always choosing firefighting over hanging with mom, and Sam is on the outs with his girlfriend. Meanwhile, the tension between Sam, Chill and Fai remains thick, and factors into Fai and Sam’s mishandling of a factory fire. Add that to a nearby natural gas pipe, an untimely funeral and terrible management at the main power plant (you know, the one that Chill’s kid is currently visiting), and you have the makings of a disaster like a Hong Kong-wide blackout. Just imagine the potential chaos. Keep imagining. While the blackout occurs and Hong Kong is sent into territory-wide alarm, As the Light Goes Out stays clear of street-level problems, instead concentrating on the fire at the power plant. The fire makes for a strong second-half set piece but the journey there is unconvincing. There are temporal jumps that make no sense; in the amount of time it takes for one character to travel from the factory to the power plant, another character goes to the factory, witnesses an accident, goes to the hospital, files a report, returns to the fire station and then broods for an hour. Also, the film portrays an incredible amount of ineptitude from government employees, who let their egos override their professionalism and common sense. The screenplay features many moving parts that meet far too conveniently, plus everything happens in a single day, the “hottest Christmas Eve ever”, and there’s even a typhoon approaching! If the filmmakers included a terrorist attack in this collection of events it would only be slightly less believable. Labored set-up aside, the film’s second half manages greater power as the firemen attempt to rescue people trapped in the power plant. The action is sometimes incoherent, with shaky camerawork and even shakier editing used to transmit the chaos, and the emotions never stray from the expected ones. However, the conflicts between the firemen are understandably trumped by the need to do their jobs, and their dedication and teamwork is portrayed in rousing fashion. Not every relationship is resolved but the unspoken honor and heroism compensates. The cacophony of actors yelling, emoting and escaping from smoke and fire keeps tensions high, and helps to camouflage the innumerable plot holes and logic issues. Derek Kwok occasionally slows things down, using faux artistic flourishes to create overblown moments, particularly during one over-the-top montage at the climax. However, the combination of lyricism and pyrotechnics provides a final and also satisfying emotional catharsis. As the Light Goes Out ain’t art, but it comes off better than it should. Kwok’s attempts at meaning don’t work as well on the script level. There’s voiceover and spoken dialogue that pretentiously uses smoke as a metaphor. People talk about escaping smoke, running from it, conquering it, etc., and Kwok adds to this attempt at profundity with visuals. Smoke is portrayed almost like a living creature, snaking and billowing in search of its prey. Basically, Kwok brings the Smoke Monster from Lost to Hong Kong as a stand-in for fear, insecurity, doubt, etc. The metaphor is stretched rather thin and is never as convincing as it should be, but Kwok has more than smoke to get his meaning out there. The visuals, montage, editing and strong character archetypes all work in Kwok’s favor, and compensate for the clumsy metaphor, expository speeches and intrusive voiceover. As the Light Goes Out is messy, baroque and frequently overblown, but its mixture of elements results in something with surprising emotional power.